Guru Gobind Rai Ji (old name of Guru Gobind Singh Ji, also Guru Gobind Das) won the battle of Bhangani in 1688. When he, along with many Sikhs was returning to the city of Sri Anandpur Sahib Ji, he reached near a small village of Toka. The majority of residents of village Toka were ‘Rangharhs’. They were thieves. They got a chance and entered the camp of Guru Gobind Rai Ji’s army. They managed to take two camels with them. When the Sikh soldiers did not find two camels, they informed Guru Gobind Rai Ji. Guru Ji called ‘Rangharhs’ of the village and enquired about camels. ‘Rangharhs’ said they did not take any camel. They said, “Other thieves must have stolen your camels. We have not seen your camels”. They then went back to their village. There was/is another village, named ‘Laaha’ at some distance. Majority of its residents were poor people. Guru Ji called them to his camp and asked to go to Rangharhs’ village as beggars. A resident of village ‘Laaha’ went to village ‘Toka’ as if he was a beggar. He found both of camels of Guru Ji there in the village. He came back to Guru Ji and informed that camels were tied there in the village of ‘Toka’. Now, Guru Ji called ‘Rangharhs’ of village ‘Toka’ again. ‘Rangharhs’ were now frightened because their crime was highlighted and proved. They apologized to Guru Ji. Guru Ji said, “The residents of village ‘Laaha’ will always get ‘Laaha’ (profit) and residents of ‘Toka’ will face ‘Tota’ (loss)”. Guru Ji planted a few trees there. A tree of mango still exists and reminds the holy Guru, who once visited here and purified this land. A beautiful Gurdwara is built there in the holy memory of Guru Gobind Rai Sahib Ji. The Gurdwara Sahib is known as ‘Gurdwara Toka Sahib’. Another Gurdwara is built where Guru Ji used to meditate in a solitary and peaceful place near the main Gurdwara Sahib. Two Sikh soldiers who were wounded in the battle of Bhangani, died here. A small building of a Gurdwara is built as their memorial on the bank of ‘Sarovar’ (pond). I had the chance to visit Gurdwara Toka Sahib twice along with my team. First I visited with my team members S. Surjit Singh, Gurpreet Singh ‘Sandy’and Yadwinder Singh. During my second visit, Gurpreet Singh ‘Raju’, Gurpreet Singh ‘Sandy’, Harpreet Singh, Jatinder Singh ‘JD’, Rachhpal Singh and Monu accompanied me. There is no population near Gurdwara Sahib, so this place is very peaceful. The village of ‘Toka’ still exists. 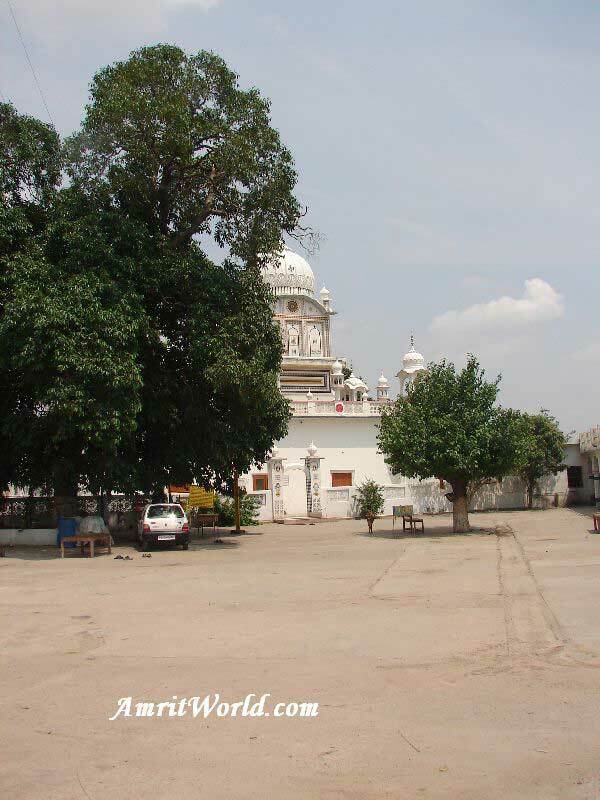 Because the Gurdwara is built on village Toka’s land, it is named as ‘Gurdwara Toka Sahib’. The ‘Guru Ka Langar’ (community kitchen) is available. Another Gurdwara is built where Guru Sahib used to meditate. It is situated on a peak of nearby small hill. (See Pictures in Gallery Section). 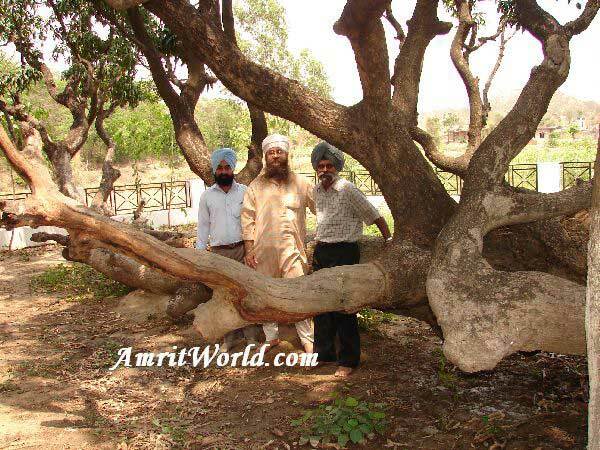 The historic Mango tree planted by Guru Ji is still there. When we visited there, it was the season of mangoes. (See Pictures in Gallery Section). We felt blessed when we tasted the ‘Achaari Amb’ (mangoes used to make pickle). The Gurdwara Toka Sahib is situated in present Himachal Pradesh state of India. It is situated on the border of Haryana and Himachal Pradesh. A road connects Toka Sahib with the city of Narayangarh (Haryana). We also visited the village ‘Laaha’. It is situated on Narayangarh-Raipur Rani road. A Gurdwara (Gurdwara Sri Guru Singh Sabha) is built there in the village. Local residents believe that Guru Gobind Rai Sahib visited the village. They say that horses of the Guru’s army were given water from the village’s well. The well still exists. (See Pictures in Gallery Section). Sikh families are in good number in the village. Many of its residents are settled abroad. One must visit this village of ‘Laaha’ to see how the word of Guru Sahib is proven true. (View Pictures of Gurdwara Toka Sahib). This entry was posted in English Articles and tagged Gurdwara on June 17, 2008 by admin. History is totally fake and havent covered various facts of gurdwara sahib. First that were not camels that were horses secondly that is not Tap asthaan that is Kangha sahib thirdly that mango was not planted the seed was dropped. Fourth no info about old well bamboos and neem tree over there. Fifthly that place shahidan wali i think that is recently made. Thank you very much for this information. I never heard about his gurdwara sahib. When I visit India next time, I will visit Toka Sahib and will have darshan of this gurdwara sahib. I visited Gurdwara Toka Sahib when I went to India last year. It is really a nice place. Very calm. No pollution. I missed Laha village. jThanks for this information and especially for pictures of Toka Sahib and laha. Thank you for this information. I had never heard of this gurdwara ever before.